What a perfect theme for me this weekend. 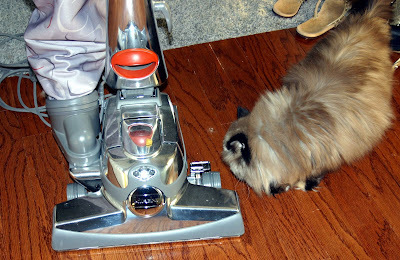 I am so thankful for all of my friends on the Cat Blogosphere. Your kindness in words and deeds the past two weeks has warmed my heart and brought my Mom leaking eyes so many times. I am doing so much better this weekend and I am sure with your continued purrayers, I will continue to feel better. Mom Robyn has donated a beautiful AmethystPendent for a raffle to assist with my vet bills. I think it is just perfect that this beautiful piece of jewelry was picked to help me because it is my mom's birthstone, so it must mean lots of luck. Thanks Mom Robyn and all of the CB gang! I am also so thankful for those of you who do beautiful graphics of me, especially Diamond and Zoolatry. 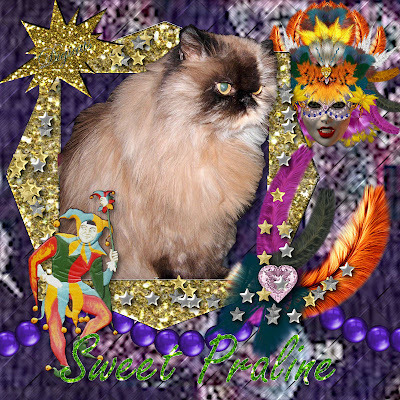 The picture below was used on Diamond's Thursday Thirteen last week in honor of Mardi Gras. I love the fact that my "natural mask" gives me permission to pawty! 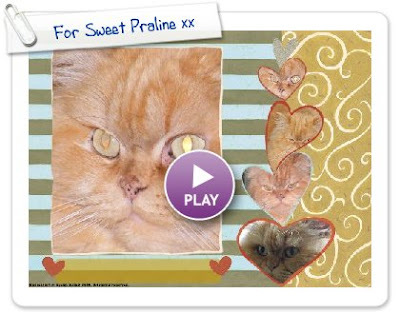 "Sweet Praline comes with her own built in mask! I guess that means she is always ready for a bit of a Paw-ty!" Zoolatry featured me on the High Five Sunday last week with the graphic below. I just love it!!!! Mom Paula - Praline is doing so much better. She is more sociable again and is slowly getting her appetite back. Now that things are settling back to "normal", we should be able to begin visiting again! Thank you so much for everything you have done with week! I am feeling all better and floofy! This photo was actually taken this morning so I could show you how much better I am looking. My mom and I had a great day on her birthday and she wanted me to tell everyone thank you for the well wishes. Don't forget to go to Misha and Cosmo's blog and vote for the best toehawks! There are some wonderful kitties that are finalists, including me! The last day to vote is Sunday, so please go by and vote for your favorite! I've included a video below that shows my special toehawks in action. 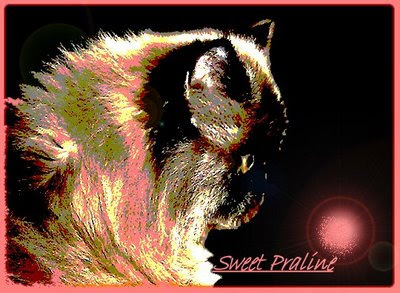 Sweet Praline - Guess what? Today's my mom's birthday! She was born 53 years ago today. Boy, she sure is ancient! Mom Paula - Praline I feel 73 after the week you've put me through! Thank you so much for all of your purrayers! They appear to be working. I gave mom an early birthday present last night by playing THoE all by myself! I was running all over the house!! Mom just laughed with joy! Pee ess - Mom does need more gum surgery and it is scheduled for March 20. It's a long story - let's just say she was very ill two years ago with an abscess that went into her sinus cavity and began calcifying! Luckily, she has a great oral surgeon that caught it and has been working with her to correct all the damage. Mom said she experienced two totally different emotions on Tuesday concerning my health. Yesterday morning, she was still very worried about me because I was being more unsociable than usual and basically staying in the back room. She hated leaving me to go to work, but when I came out of the back room long enough to eat some of my stinky goodness, she felt a little better. Just try and crawl under here and get me! I'm not coming out! 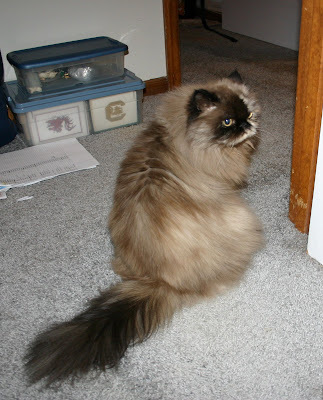 When Mom got home Tuesday night after her adjustment and trigger point therapy (she really needed it after the stressful weekend with me), I met her at the door meowing for treats. I had eaten most of my stinky goodness, had drank my water, and had used the litter box. I followed her around the house for the first time since last week and even let mom trim my front claws. I think I am feeling a little better. A bonding moment with Mom on her lap Tuesday evening. Mom Paula: I'm almost afraid to say Praline is doing better because of the roller coaster ride the past week, but she was acting more like my little spoiled Diva. I just love the picture of her on my lap. Please keep those thoughts and purrayers coming. They mean so much! Pee ess - My mom goes back to the Oral Surgeon today to discuss the possibility of another gum surgery (this will be the 5th surgery on her mouth in two years). Mom took me back to the Vet yesterday. The Vet believes that I have picked up a stomach virus that has been going around and that I possibly picked it up on Wednesday when I went to the other site. She gave me some Sub-Q fluids and a shot of Reglan to control the vomiting. I slept a lot on Monday and haven't been vomiting anymore. Let's hope this was the problem and I will be doing better very soon. Even my laser eyes didn't keep me from the Vet! Resting on Mom's foot rest is one of my favorite spots. Thank you for all of your thoughts and purrayers. I hope to be visiting again in a couple of days. 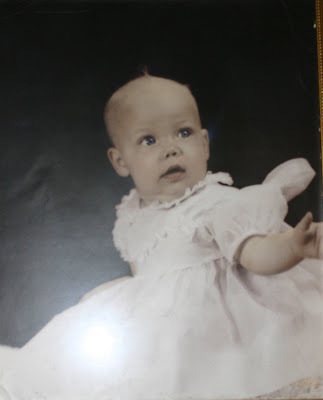 My Mom's birthday is Thursday and I want to be well for her! 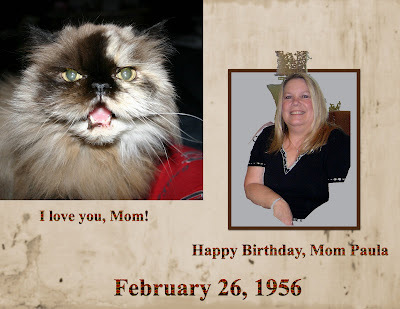 Mom Paula: All of your thoughts, well wishes, purrayers and assistance means so much. I am still quite worried about Praline, but I must remain positive she will be okay. Update (11:02 am). Back from the vet. The vet thinks I may have picked up a virus from the clinic office I visited on Wednesday (my vet has two different locations and the normal one I visit was closed on Wednesday). She said there had been several kitties that had visited that office and within 4-5 days, they were back with the vomiting. They don't know what this virus is, but said the kitties were usually okay within two days after getting medicine. I've lost a few ounces of weight, which the vet said is normal with the vomiting, but she does want to get it back up. My temperature was normal and she felt no blockages. She did stick a needle in me to give me some Sub-q fluids and a shot of reglan for the nausea. She told my mom to watch me closely today, so mom is working from home. The vet said no treats for a little while (oh no!) and to just feed me the Royal Canin Persian 30 dry food for a few days. No stinky goodness for me! Thank you for all of your kind words and purrayers! I was doing a little better since I saw the vet on Wednesday until Sunday morning about 5:30 am. Mom heard me "yaking", which woke her up and she saw that I had thrown up a hair ball. She felt much better because I was getting rid of the fur. Unfortunately, around 4:30 pm, I threw up again and this time there was no floof. I got sick once again around 10:30 am last night (no floof). I have a good appetite and am eating, drinking my water, and using the litter box, but this vomiting is a reason for concern. Mom is waiting to call the vet's office when she opens at 8:30 to schedule an appointment. I will update everyone once we get some news. Thanks for everything that you are doing! Update (4:30 pm) - I got sick again. Mom is getting a little worried and says I may go back to the vet tomorrow. Update - I threw up again this morning. There was a lot more of my floof in it, so Mom thinks the Laxatone may be working and I am getting rid of it. However, she's still going to watch me very closely. Mom and I are feeling better today. She must go to church to play the piano and she has a solo today, but then she is coming home to rest with me the rest of the day. In the meantime, I am going to take a little snooze until she comes home. Today's Photo Hunt theme is "Warm". There are so many things I could choose for this theme because it is very warm in SC in the spring and summer. The care and concern of all of my CB friends "warms" my heart. For the photos, I chose to show two ways that I get warm when it does turn cold in SC. I love to stick my face directly in front of the heat vent and let the warm air blow on me. 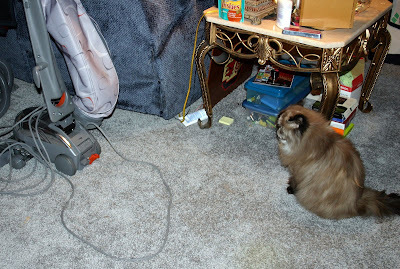 Of course, this works two ways - when when we have the hot summers, I love for the cool air to blow on my floof! Nothing like the warmth of a good fire. On a different note: Thank you so much for your visits, well wishes, and purrayers. Mom stayed home on Friday and both of us slept most of the day. We are both feeling a little better! Thank you so much for all of the kind words and well wishes this week! My mom and I have been taking it easy the past two days. I take the last of my liquid medicine today and have four more days of the pills. Mom says we can ease up on the Laxatone a little. The pictures below are me snoopervising my mom last night while she helped me visit my friends. Mom, please make sure you thank everyone for their good wishes and purrayers! I'm getting tired now, so I am going to rest a little. It's been a rough week! We had a double whammy on Wednesday! Mom came home sick and then she realized that I wasn't doing so well either. Needless to say, she whisked me back the Vet. The Vet said she didn't feel any blockages and everything sounded well. Mom said I kept going in and out of the litter box, so the vet wanted to check my bladder. At first she told mom that she was going to keep me overnight because my bladder was small at the time. Mom got 1/2 way home and the Vet called her and said as soon as I got in the cage, I went to the bathroom, so Mom turned back around. When she got back the assistants told her the Vet wanted to see my Mom in one of the examination rooms. Mom said her stomach got a big knot in it. The Vet came in and told mom that she thought I had a bladder infection. She thought it could have been brought on by the stress of going to the Vet Monday and trying to get rid of the floofball. She said to continue the Laxatone twice a day and now I have two additional medicines to take. The Vet said I should be better by Friday. Next month is my annual check-up and the Vet said I she would probably do bloodwork then. Please keep me and my Mom in your thoughts and purrayers! Is your paws so floofy you can go skidding across da floor? All the time! I make my mom laugh when I go skidding across the wood floors. Do slinkies joke that you must be bonkers cos your paws have so much floof growing out of dem? I've been told I should have them trimmed. We is looking for the most spectacular toehawk. Here is a picture of one of my front paws with it's toehawk. I like to use this paw because it is tri-colored. Here's a picture of one of my front paws with its toehawk! Mom says it's a little blurry because she had to hold both me and the camera. Hee! Hee! They are so long, you can't see my paws or claws. Just to prove to you these are my paws, my mom helped me expose my claws on my back paws! I think I definitely have floofy, long toehawks! I'm up for the challenge!!!! I threw up two more times today, so Mom decided it was time to go to the Vet. It turns out that I picked up fleas again (guess it is from the recent warm weather) and between the seasonal shedding and licking the flea bites, I am swallowing a bunch of floof. My temperature was normal, the Vet didn't feel any blockages, and my weight was still fine. The Vet gave me two big slabs of Laxatone (yuck!) and a treatment of Advantage. Mom still needs to watch me closely, but the Vet thinks this will do the trick. I do have my yearly checkup next month when they will steal my bloods and other stuff! Here I am imprisioned in my PTU! Let me out! After a little drama, I decided to explore. I was trying to figure out how to get up on that shelf when the Vet walked in. Mom didn't get a chance to take any pictures duing the examination because she was holding me and keeping me calm. I only hissed when the Vet checked out my backside. The extra Laxatone started working last night and Mom says I stink a little. It's not my fault she brought in the fleas. Let's hope this does the trick and nothing else is wrong. As usual, my Mom is a little worried. Wanted! Dependable bean for secretary for the Minister of Floofy Affairs (that's me)! Must be willing to give lots of treats, belly rubs and grooming. Oh yes, and must love floofy kitties. Only loving applicants need apply! My Mom has been MIA since Friday which makes it nearly impossible to keep up with my duties. Will you be my substitute mom? I mean, secretary? UPDATE! Mom is home! She had to come home early because her friend caught some bug and mom didn't like that bug, so that gives us a whole day together. Now to work on those secretarial skills! Sweet Billie and her mom, Lorianna sent us a special Valentine's package! Mom got bunches of chocolates and I got a mouse dipped in the nip. Thank you so much Billie and Mom! Here is a video of me playing with my mouse! My grandpa and grandma bean are watching over me this weekend, so I am getting a bunch of treats! Yay! I am still working on that floofball! 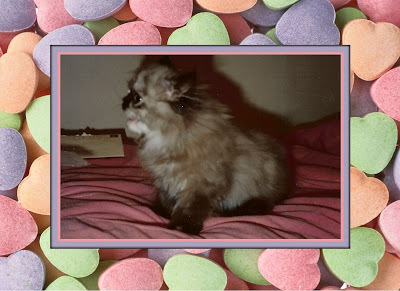 I want to wish a very Happy Valentine's Day to all of my furry friends out there and to their beans. Take the time today to give someone a hug! 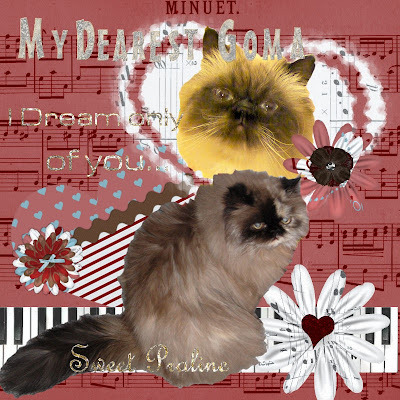 A very special thank you goes to Miss Diamond for my Valentine's cards to Goma and Bhu. But watch out Goma and Bhu, I received a special Valentine from Ginger Jasper and he wants to be mine also!!! Pee ess - mom left last night to go out of town for the weekend, so I won't be able to visit this weekend. She promised she would help me catch up on Monday. You must excuse my Mom! She thought yesterday was Friday, so you got a Floofy Friday on Thursday. I didn't want to disappoint my fans, so I insisted she do another Floofy Friday of Baby Praline today! 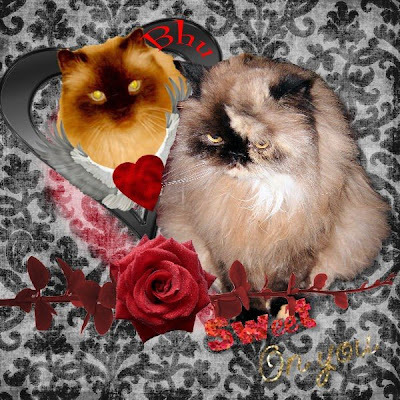 Bhu and Goma, make sure you come back tomorrow for your Valentine! 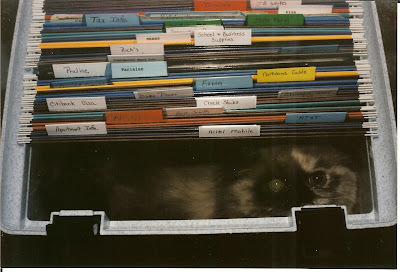 Filed under F for Floofy!!! Mom's a little worried about me because I have been trying to get rid of a floofball for a few days. She keeps slabbing that laxatone stuff on my tongue. I just keep leaving surprises on the rug. Pee ess - mom always get worried when things aren't going perfectly. Mom Paula - Hush, Praline. It's finally here! 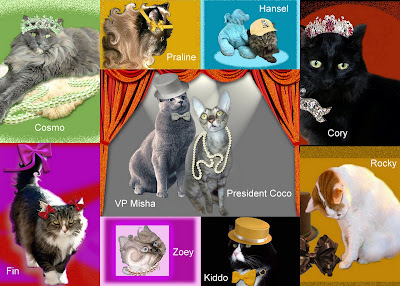 The Inaugural Ball for President of the Cat World, Coco and the Vice President, Misha. All of the members of the Cabinet are present in their finery! Madame Coco appointed me as Minister of Floofy Affairs and I will take my job very seriously. In the meantime, let's have fun! 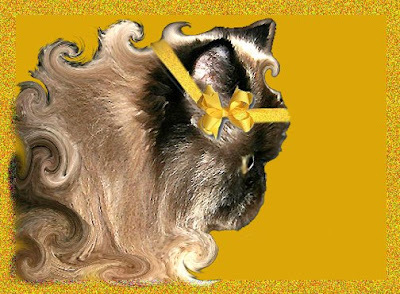 curly-up-do, banded in gold ribbon, as a salute to Madame Coco. Madame Coco, our beautiful, ever elegant Cat President of the World (and Minister of Frootbat Affairs... need we say more) is escorted by the Honorable Sir Misha, the esteemed Vice Cat President of the World. Sir Misha also serves in the capacity of Minister of Foreign (a/k/a female felines) Affairs... again, need we say more? 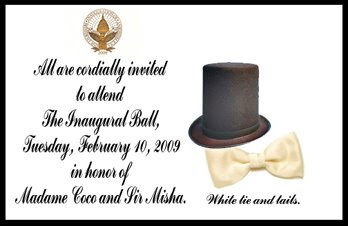 Tuesday is the Inaugural Ball for Madame Coco and Sir Misha. I already have my dress attire picked out, so today I am getting the extra beautification treatments! Mom has already trimmed my claws, so I am smoothing them over by using my scratching post! I don't know why Mom insists on getting a "backend" view of me. I must maintain my beautiful floof since I am the Minister of Floofy Affairs. Mom is assisting by brushing my floof (notice the floof on the brush again). I look forward to seeing all of you at the ball! Thanks to Secret Agent 007.5, Harley (with my assistance), the culprit for stealing my floof has been found! It was the evil Kirby Monster!!! Kirby has been in hiding for quite a while and began sneaking out of the closet a few days ago. Mom is trying to claim she had nothing to do with it, but after that "age" blunder, I must keep my eyes on her. I reminded my mom that I must be in all of my floofiness for the Inaugural Ball on Tuesday, so she could just put Kirby back in hiding. I think I smell my floof!!! Just look at that evil red smile! Kirby, give me back my floof!!!!!! By the way, Mom says thanks for all of the ideas for my excess floof (Mom! I don't have excess floof). Some of the suggestions were to put the floof outside for the birds to use in building their nests, send the floof to the shelters to help warm up the "not so floofy" kitties, or even get someone to convert my floof into yarn and make a sweater or purse. I prefer to think that my floof is extremely valuable, especially since I have been named as the Minister of Floofy Affairs, and someone (MOM) is trying to sell my floof on the black market. For that reason, I have hired extra security for the Inaugural Ball on Tuesday. 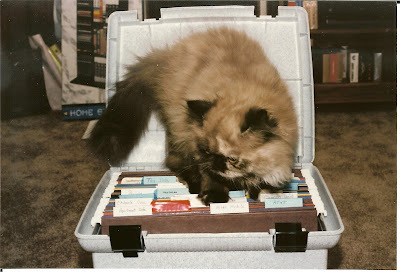 Secret Agent 007.5, Harley, is hard at work on the case of the missing floof. He thinks he has a lead and is convinced I should see positive results soon (MOM, can you repeat "TREATS?"). I thought I would assist SA 007.5 in the search. Is my floof up in the chimney? I know smoke rises when there is a fire and my floof is very light, so maybe it went up there. Is my floof in this bag? Mom is always leaving the house with this bag. She claims it's paperwork for work, but I'm not so sure . . . Mom, what are you doing with my floof? Pee ess - Sorry I haven't visited much this week. Between my search for my missing floof and mom's job and her painful neck and shoulder, we are both exhausted. Mom promises she will help me catch up with my visitation this weekend. Harley has been helping out with his screwdriver and flashlight and we still can't find out where Mom is putting all of my floof. It was suggested by one of the kitties that Mom is either trying to clone me or build a sweater from my floof. And you thought you could fool me by putting logs in the box. I just know there is something else in this box! This one is open! Harley must have been successful with the scredriver on it. I wonder what he has found out. But this box is empty.